Professor Michael Denning has offered a unique history of the early days of electrical music recordings with Noise Uprising. The earliest sound recordings were analog, recorded straight to a disc through a sound horn, but electrical recordings introduced a microphone to capture sounds before inscribing them on a disc (later came magnetic tape and then digital media). The microphone greatly enhanced sonic fidelity, at roughly the same time that phonographs for playback dropped dramatically in price. These, among other factors, led to a brief surge in the recording of “vernacular” music from 1925 to 1930, at which point the Great Depression decimated the global market for sound recordings. It was a time when recordings went from being novelties and marketing gimmicks to promote other sales to being valued cultural artifacts in their own right. Denning is well versed in recordings from around the world, and readers may learn about some genres from other parts of the world for the first time, whether Cuban son, Egyptian taarab or Indonesian kroncong. 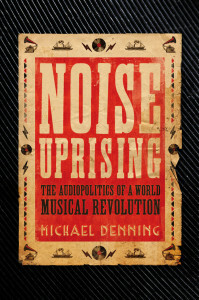 To supplement the book, he has also created a “Noise Uprising” playlist through a free online streaming music service (login information provided in the book), featuring some of the song selections discussed in the book. For many readers, nothing short of listening to the recordings being discussed will capture the full effect of the music. There are detailed passages exploring the nature of “noise” and its relation to the music that developed in conjunction with the rise of electrical recordings in the late 1920s. Denning examines the role of rhythm, including the rise of “rhythm sections”, and the unique role that recordings took in overturning the dominance of published sheet music. He provides a rather excellent summary of how early recordings were seen as supporting the sale of sheet music, with most recordings sold by furniture stores to create a market for phonographs (which were treated as furniture), whereas the electrical era actually supplanted the primacy of printed music and enhanced the role of the performers (and the esteem granted to their abilities to improvise), before radio hardware manufacturers bought up record labels as they began failing amidst the Great Depression. The boldest claim Denning makes is that a musical revolution took place through unique contributions of global port cities. This claim (inspired by the compilation album series The Secret Museum of Mankind: Ethnic Music Classics), while intriguing, is not conclusively supported. There are anecdotes, but not much to refute counter-theories or any attempt to systematically test the validity of the hypothesis. Still, whether or not you agree with that theory, the rest of the book is still a fascinating account that doesn’t depend entirely on that hypothesis. For instance, Denning draws on an impressive amount of prior research to catalog the sales volume and import/export characteristics of the music industry just before the Great Depression — elaborating where and how music was recorded, where the records were pressed, and where they were shipped for sale. He also brings a leftist (Marxist) perspective to the analysis, and a more astute awareness of economics than that of most music writers. For instance, at numerous points the book discusses the tensions and usage of vernacular music by countries of the Third World project. Towards the end, Denning even makes some sharp observations about how tensions with copyright regimes in the Neoliberal era have pursued an “enclosure of the commons” program that was resisted by the Third World nations until their capitulation in the late 1970s (after the Third World’s New International Economic Order proposal was defeated) at which point Western capitalists began to apply the “World Music” label to market this sort of music as a commodity — whereas about a half century earlier the same sorts of recordings were marketed as “folk” music. Even readers lacking any specific interest in musical recordings of the late 1920s may find much of interest here. Denning’s extensive discussion of the role of recordings in placing timbre, and the role of contrasting timbres on recordings, in the foreground of musical practice make interesting fodder for a discussion of the practices of later musicians like iconoclastic jazzman Ornette Coleman with his extreme sensitivity to timbres, or Denning’s perspectives on “exotica” as being linked to the early formations of anti-colonial struggles might inform interpretations of the way eccentric jazz bandleader Sun Ra led a musical commune for decades that incorporated elements of exotica. For that matter, as Denning discusses the way the collapse of the record industry around 1930 was like a failed revolution, the idea that revolutions reappear across time and space might help explain the emergence of rock ‘n’ roll recordings a little more than two decades later. And, of course, this is a valuable pre-history to help contextualize the rise of hip-hop decades later — another revolution from below that relied on re-purposing of existing musical materials. Although scores of writers from around the globe are cited, from musicologists and amateur critics to anti-colonialist theorist Frantz Fanon, Denning uses Theodor Adorno as a reference point for much of his analysis. Denning doesn’t just repeat Adorno’s theories — Denning offers ample critiques, mostly from a Gramscian perspective. In some ways, this limits the analysis, stopping well short of post-Marxist analysis from the likes of the sociologist Pierre Bourdieu, and tethering it to a predominantly economic class-based framing. When he discusses the way harmony was a mechanism for vested interests of society to exert influence in the musical realm, the book screams out for something more like Bourdieu’s sociological analysis or a similar one of institutional economics. This old Berger quote is about as concise a summary of Denning’s “noise uprising” thesis as possible.